There are at least 28 million small businesses in the US which account for about 54 percent of all sales. There are also 900,000 franchise businesses across 300 business sectors of the economy. And yet, despite these numbers, it’s not often that you will come across small business brands that are also franchises. This is where Ciara Stockeland, the founder of MODE, bucks the trend. 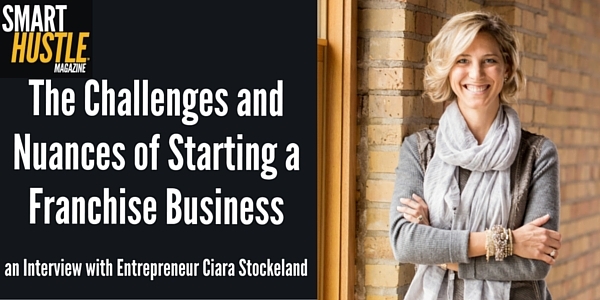 Ciara Stockeland has always been an entrepreneur at heart. The founder and current COO of MODE, a designer outlet store, has been running businesses since she was 12 years old. In 2006, Ciara opened a high-end maternity store in Fargo, ND for women who wanted to remain fashionable throughout their pregnancy. A year later, she opened a second business, which was supposed to be a temporary pop-up store to sell an overstocked supply of designer wear. However, the business proved so popular that in 2008, she merged her two stores to create MODE, the business that she and her husband are in charge of today. By 2011, the business expanded by signing its first franchisee. To say that Ciara Stockeland is an ordinary small business owner would be a massive understatement. Under her leadership, MODE has expanded to 12 locations across the Midwest and South Carolina. As she states in her interview, “small businesses are really the heart of this country, and this country was built on small business ownership.” Ciara’s is an active member of SCORE and has been recognized as a Small Business Champion. Her franchise business model has also netted her the Outstanding Franchise Small Business Award. In our interview, Ciara goes on to share the challenges and nuances of starting a franchise business. Here’s a summary of what she shares in the interview, but you can get the whole story by listening to our interview below. It didn’t take long for Ciara to realize that there is a world of difference between running MODE the retail concept, and MODE the franchise model. She soon found out that she had “two businesses” instead of one. She learned how to run two businesses simultaneously in order to make both the retail and franchise models successful. This required her to become efficient in how she managed her time and energy. She learned how to structure her business in such a way that would allow for easy duplication by other franchisees. No matter how many people bought into the brand, they would all be able to easily implement MODE’s business model despite their different personalities. Ciara had to think strongly about whom she granted the franchise licenses to. Not everyone who wanted into the business had cultural and motivational alignments similar to hers. She had to take the time to find the right partners to expand her brand. Franchising is not for everyone. In order to implement this business model successfully, you have to overhaul all your business systems and processes in order to make it work. Is that something you are willing to do? Then franchising might be a good direction for your small business too. Ciara is a huge proponent of SCORE because she has benefited from the associated mentorship programs. As a result, she is a huge believer in giving and getting mentorship when running a business, something that she goes into great detail about in her interview. Mentorship is what helped Ciara decide to merge her two stores to create MODE, so she is happy to provide this service to other franchisees whom she works with. In fact, she has taken steps to ensure that her staff can provide helpful advice and coaching to franchisees as well. If you do not like the idea of taking business advice from other people, franchising may not be for you. The same rule applies if you don’t like to dole out business advice. Mentoring franchisees is an important aspect of retaining your brand identity and helping your franchised stores to succeed. MODE is Ciara’s brainchild, and she has worked hard to make the business what it is today. As a franchiser, she gets to set the rules of engagement. After all, she doesn’t want to see her hard work go down the drain, which would happen if a franchisee failed to follow the rules or compromised product and service quality. Ciara emphasizes that prospective franchisees have “to understand that they need to be comfortable with very little freedom.” This is important to their success as small business owners buying into an already existing brand. This particular piece of advice is one you would do well to remember should you decide to become a franchisee. If you aren’t willing to play by the rules, it might be better to start your own business from scratch. In my interview with Ciara, she shares plenty of advice about working in a franchise business – whether you are the franchiser or the franchisee. If you are interested in exploring the world of small business franchising, get Ciara’s words of wisdom by listening to the interview above.